I’m about to give you not one, not two, but THREE singe-serving protein cheesecake recipes. The first is more of a blueprint in the sense that there’s no formula attached, no recipe per se – just a framework. It’s designed for those of you who, like all of us here at Pow, like playing with food and taking chances. The second recipe is a more traditional recipe and the third is a combination of a freestyle approach with a traditional recipe attached to it. If you want the recipe for the cheesecakes in the photo above and don’t care much about understanding the fundamentals of ‘protein cheesecakery,’ scroll on though to Recipe 2! But if you want to find out more, check out the whole post. There are two parts to every cheesecake: the crust and the filling. You need to understand the basic structure of both the crust and filling if you want to freestyle your own protein cheesecakes. C) Ground nuts/seeds (e.g. ground seeds, ground almonds, ground hazelnuts) or nut/seed flour (flaxseed, ground sunflower seeds, coconut flour, almond flour, peanut flour). You need all three of these components to make a proper Pow crust. If you miss one or exclude one, your crust won’t work. As an example, let’s say you omit A and just use B and C. What will happen is you’ll end up with a crumbly crust – there’ll be nothing holding it together so when you go to pick up your cheesecake, buhuhuhuhu: it’ll fall apart. That’s why we need the syrup. Think of it as our ‘gluen’. OK, what if you omit C? Well, then your crust will stay wet and on top of that, crumble as well. If you omit B – your crust will be doughy, pasty, and not like a crust at all. When it comes to protein cheesecake making, people often mess up their fillings by adding too much protein powder. The result is a tasteless and breads-like pseudo cheesecake that, if you care about food as much as I do, will break your heart. A) Protein powder (ideally whey but see Note 2 below for a vegan version). C) egg or egg whites. D) Some stevia or sucralose drops (I link you to my favorite in the recipe below). To freestyle your own cheesecake, you first need to make your crust by combining the above three crust ingredients to the point where what you end up with is a tasty thick dough that you can press into the bottom of your tin – or muffin cases. It’ll be a bit like truffle dough so, if you taste it, try not to eat it all! Because it’ll taste great. So mobilise a bit of self-restraint. When it comes to ratios, you can play it by ear. Simply put your nut/seed butter in a bowl, add the ground nuts/seed or ground nut/seed flour until you get a slightly doughy + slightly crumbly mixture, and then add enough syrup until you get the perfect thick dough – one that doesn’t stick all over your hands. For the filling, you have to keep as your goal a thick but runny batter. A batter like a pancake batter. You know, not runny so it looks watery, but thick, smooth, and creamy. What you want to avoid, when freestyling your filling, is adding too much protein, especially whey. Because, if you add too much, the chances of encountering a dry and bready cheesecake go up – and no one likes a dry and bready cheesecake! The perfect ratio, for me, is 250g cream cheese to 30g whey. Or 180 cream cheese to 20g whey. This ratio is slightly different depending on what kind of cream cheese you use, or if you use quark for example. But roughly speaking, the above ratio holds up. For the eggs, you want to use either egg whites or whole eggs. The latter will make your cheesecake slightly creamier but you could also use the former, it depends on whether you care about the overall fat content of your cheesecake. I find that for 250g of cream cheese and 30g whey, 100ml of egg whites does the job which is equivalent to 2 whole eggs. Again, you can freestyle things and go up or down on the quantities of each ingredient to see how they impact the overall texture. I invite you to do this, it’s fun! If, of course, you like playing with food because if you don’t, well… the uncertainly will probably drive you mad, hehe. 1 Preheat over to 150 C.
2 Mix the base ingredients in a bowl until you get a dough. 3 Divide into 8 and press inside muffin cups (paper or silicone). 5 Pour cheesecake batter on top of bases in the cups. (like Jelly) when you shake the cheesecakes (usually 15-22 minutes). The final recipe in this post is similar to the one above. The only place where it differs is the crust uses not nuts, just seeds. I made it to show you that you are free to switch things up and indeed, freestyle! As long as you follow the basic blueprint above, you should be able to mix things up and adapt each recipe to a) what you have at home and/or b) what you most like. 1. First, make your crust by combining all crust ingredients in a bowl until you get a thick batter that you can press on the bottom of 4 muffin cases. 2. Pour the cheesecake filling onto the crusts and place on a baking tray, with about 2 inches of water added to the bottom to ensure your cheesecakes cook evenly. 4. Bake at 150C (302 F) for about 25 minutes then turn off the oven and leave them to sit for 10-15 minutes. 5. Take them out of the oven as soon as the top is taut to the touch and they looked cooked but before they look at all cakey. You want them to wobble a little bit! 6. Let them cool completely without eating – they’re best after having spent the night in the fridge! Macros per cheesecake (out of four): 215kcals, 10g carbs, 13g protein, 14g fat. 1. As I mentioned above, we are currently sold-out of our delicious one-ingredient, hormone-free, creamy whey protein which is perfect for cheesecake-making. It’s because we’re switching out of tubs and into another packaging format. Don’t worry though, you can still get a whey protein as good as ours by getting the Organic Protein Company’s whey. It’s a bit more expensive than ours was BUT with a 20% discount code, you can actually get it for a great price. 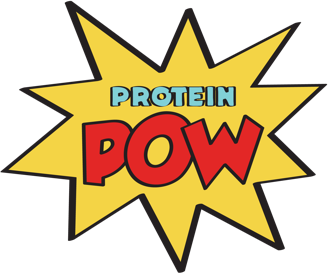 Just enter PROTEINPOW20 at checkout. I know Dan, owner of the Organic Protein Co, well and trust both him and the protein he sources fully. So I trust you’ll like it as much as you did ours! 2. If you want to make a dairy-free cheesecake, you absolutely can. The crust remains the same but you have to play around with the filling a bit. Here’s a protein cheesecake recipe that’s vegan that I think you’ll like, I know everyone here adored it, both vegans and non-vegans! 3. I like to use low-fat cream cheese to make protein cheesecakes. I’ve used quart in the past as well as Greek yog but I find the Philly makes better cheesecakes because it’s not as wet. You can try full fat cream cheese, medium, or low-fat depending on the macros/fat content you want to end up with.